this was a different truck. don't see too many of these around, though i did find other pics of this one on the web at other shows. 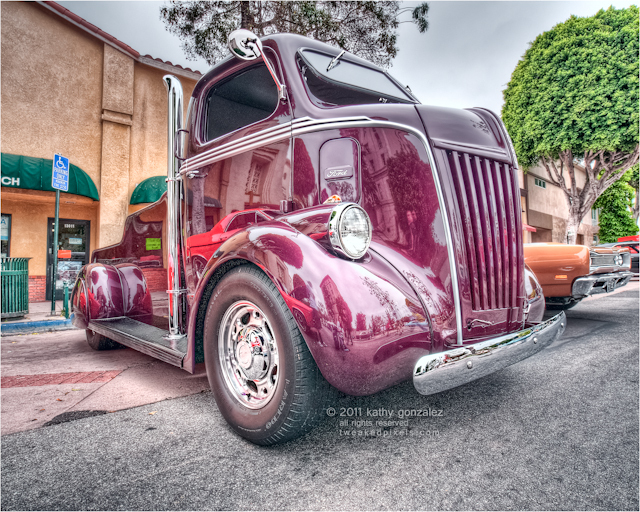 apparently its a coe or cab over engine model, hence the shortened front end. but, to me, it reminds me of those purebred dogs or cats that look like they've run into a wall and have no nose. at least in a monster like this, you'd feel safer than driving in one of those "smart" cars; in an accident, i'd place my money on this one and still being able to walk. the owner was a nice guy too. very happy to let you have a good look around the thing. thanks for moving out of the way, but i don't remember the guy standing next to me, if you can see me in the bumper. i think he owned the red muscle car you see reflected on the side. i didn't take any pictures of his car. psst. dude, close your hood – maybe i'd think about it.